Q. 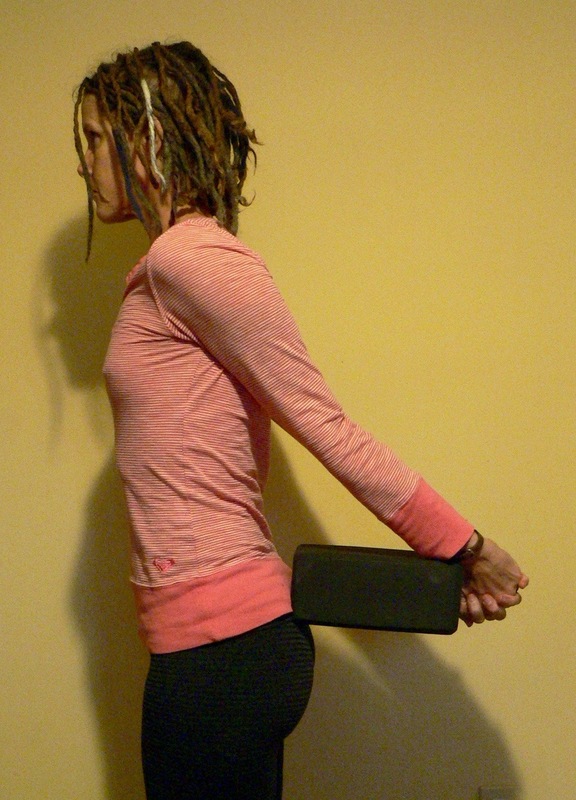 When I extend my arms, called shoulder extension in yoga, with a strap looped around my hands (or just hands clasped), I have significantly more range of motion than when I do the same action but holding a block. What is the difference? These are the kinds of questions that I ponder at 3:30 am, when I should be sleeping. I don’t have enough tacit knowledge (yet) to answer such questions, so I get out my anatomy books and play, trying to puzzle it out. It is in this way that I’ve layered functional, contextual understanding on top of fuzzy recollections and ineffectual memorization. As always, what is happening is way more complex than my summation, but you’ll get the drift. Let’s first look at the similarities. In both examples of shoulder extension, the primary movers or agonists – being the posterior deltoids and triceps – are contracting with help from latissimus dorsi aka lats, while the anterior deltoids, pectoralis major aka pecs and biceps are stretching. In the strap example, because my hands have to push outward against the strap to keep it taut, my arms are therefore attempting to abduct or move away from my body, which means my lateral deltoids are also contracting. Were the strap removed, continuing to abduct my arms would eventually bring them into the arm position of Virabhadrasana 2. The loads are different, but the result would look about the same if I were clasping my hands instead of using a strap. In the block example, because my hands have to push into the block to keep if from falling to the floor, my arms are thus adducting or moving towards my body, meaning my lats and pecs are also contracting. By contracting my chest muscles, I effectively put the break on further extension of my arms behind me because I am now co-contracting muscles that both cause and keep me from extending. And that is why I cannot lift my arms as high with the block. Co-contracting provides greater resistance for the primary movers – posterior deltoids and triceps. I don’t need to tell you this as you can experience it yourself, when you attempt to extend further. the technique I use is to place a block behind me with elbows extended (straight), press firmly into the block (~75% of maximum effort) and try to lift it higher – just like in the picture above. Adding an isometric contraction at end range of motion signals collagen production in your tendons thus increasing their stiffness and their capacity to withstand greater loads. Relax already, stiffness as a biomechanical concept is not the same as that feeling of “tight” or “stiff” often exclaimed in yoga; tendon stiffness is a desirable thing. 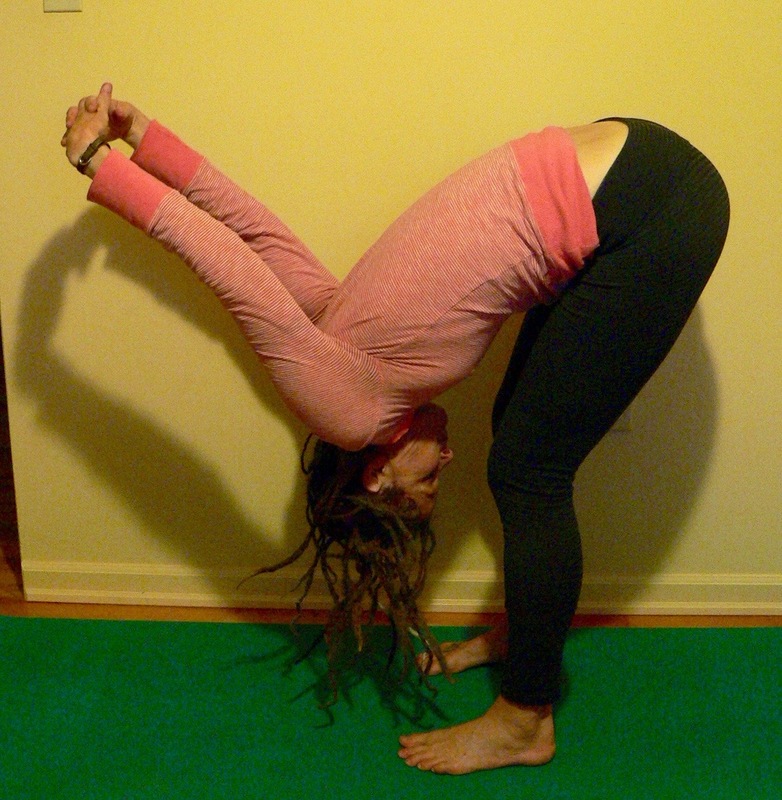 This kind of muscular work in yoga will make your tendons and ligaments more resilient against injury and ultimately may improve your flexibility. One technique I use is to place a block behind me with elbows extended, and barely holding the block, lift my arms until I hit my end range and then press my hands firmly (~75% of maximum effort) into the block, holding for 10 seconds. This technique differs from what I described previously in that I lift my arms first and press the block second; whereas previously, I pressed first and lifted second. It makes a difference how you get there. Another technique would be to press the block down onto a counter/table which is essentially trying to move into shoulder flexion and will fire the stretching anterior deltoid. At the same time, press your hands into the block (adduct) to isometrically contract your pectoralis major. It’s a lot of work! And yet another technique would be to clasp your hands and push them into a block positioned against your sacrum – here you get concentric work in the posterior deltoids, triceps, and lats as well as isometric contraction in your anterior deltoids while they are stretching at what may or may not be your end range. It doesn’t matter – you want to be be able to generate force at all ranges of motion. 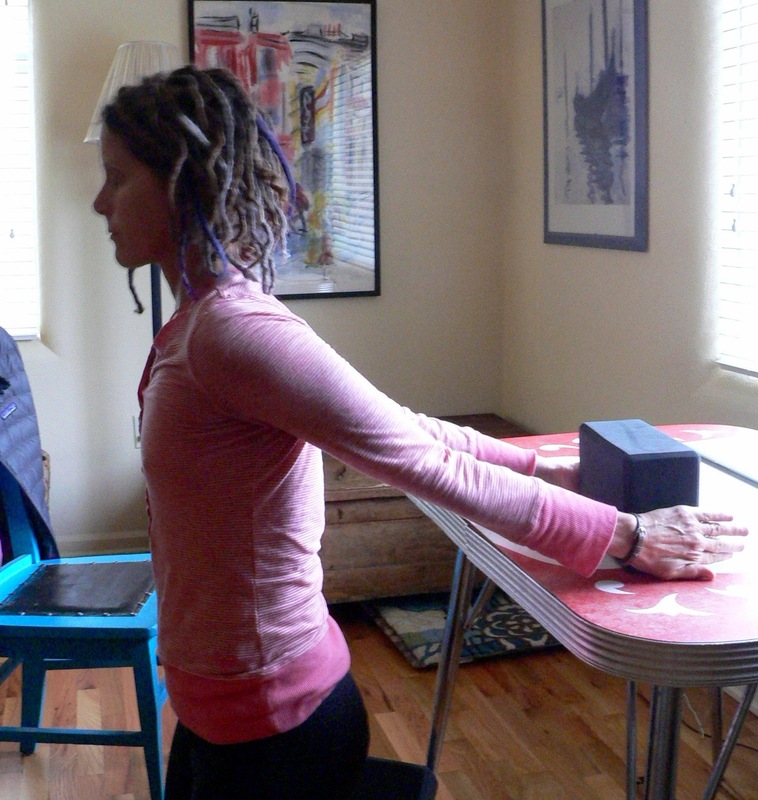 Think of this work in shoulder extension as prep work for puvottonasana aka reverse table top/plank. Ray Long, whom I introduce in an earlier post, is a master at knowing what muscles are working in just about any yoga pose you can think of. Once you know which muscles are contracting and which are stretching in a pose, you can manipulate variables to increase active mobility. He cues to isometrically attempt to scrub or drag the hands towards the hips, but without actually moving them. This simulates shoulder flexion, and just like in the examples above using the table or the block against the sacrum, it causes an isometric contraction in the muscles that are stretching, and that makes them strong, more resilient at that range of motion. 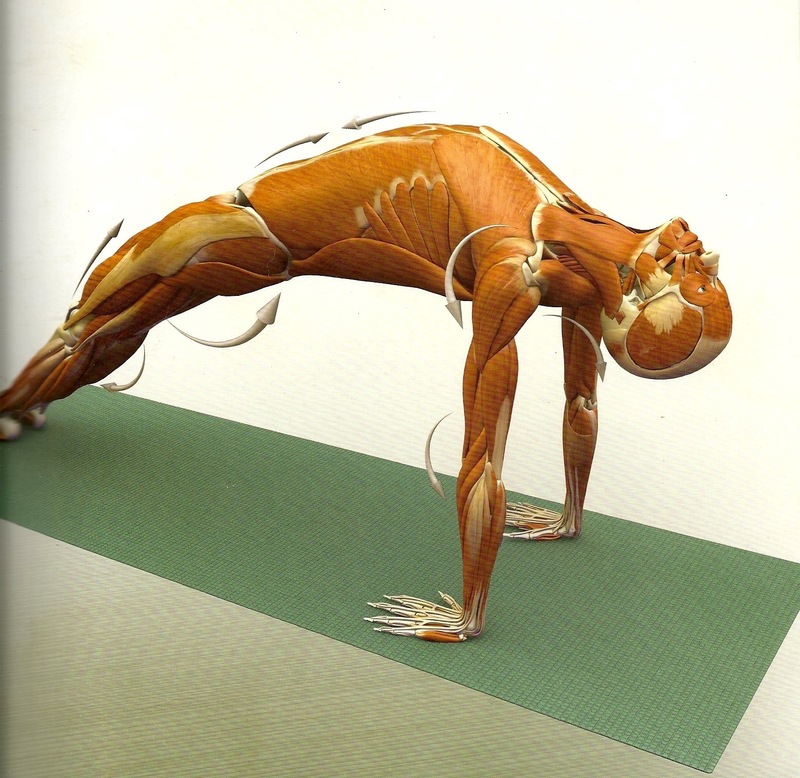 You can read more here in his book Yoga Mat Companion 3: Anatomy for Backbends and Twists. Or, you could just go back to passively flopping your arms overhead, which may increase your flexibility, but won’t increase strength and resiliency of your tissues. I like to think of passive, yummy poses as junk food yoga, a nod to Katy Bowman’s junk food walking. It’s really yummy and pleasurable, but should only be consumed in small amounts, not that often, and never in place of nutritious, connective tissue loving active mobility. Last month, I wrote about dissonance that occurs, when I perceive discord among yoga teachers and other movement thinkers, whose work I follow. As a yoga teacher, former research librarian, soon to be Restorative Exercise Specialist™, and someone with rebellious tendencies, I am wired to ask a lot of questions about what is being taught in yoga – and why – and whether cues were informed by research or lineage. Often this results in mental compromises (and annoyed teachers & colleagues) as I try to reconcile such teachings with each other and with what I experience in my body or with my students and clients. There comes a time when a clarifying convergence of ideas emerges that confirms I am on the right path and following teachings from which I am meant to learn. This is one of those occasions. 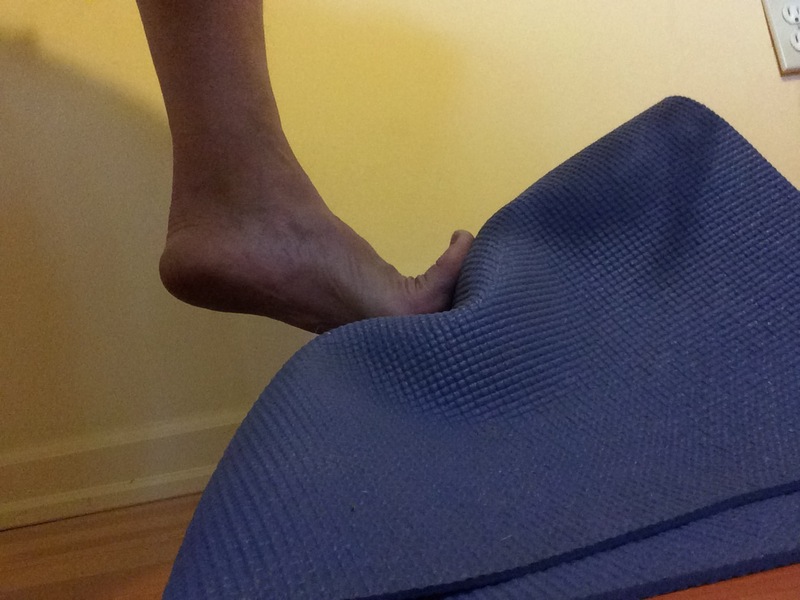 In previous posts (listed below), I discussed plantar fasciitis (aka plantar fasciosis) and biomechanical and environmental factors that can be addressed conservatively through yogasana, plantar fascia-specific stretching, alignment, and conditioning. Upon returning yesterday from what has come to be known as the Jules Mitchell Portland Tour, I found the September 1, 2015 issue of my partner’s American Family Physician peer-reviewed journal sitting on my desk with a section circled. The article was titled “Top 20 Research Studies of 2014 for Primary Care Physicians.” Basically, a group of clinicians with expertise in evidenced-based medicine performed monthly surveillance on 110 clinical research journals in 2014 (the 20th year they have been doing such surveillance). They identified 255 studies that had potential to change how family physicians practice, and narrowed that group down to 20 studies with relevance to primary care practice, validity, and likelihood that they could change practice. The section circled for my benefit was from one of these 20 studies titled “High-load strength training improves outcome in patients with plantar fasciitis: A randomized controlled trial with 12-month follow-up,” which addressed the question of whether strength training is more effective than stretching for patients with plantar fasciitis. The bottom line answer was YES. “A regimen of strength training improves pain and function in patients with plantar fasciitis faster than a typical stretching regimen. Over time, though, patients who stretch will continue to improve and have similar improvement.” My take home, after reading the full study, is that high-load strength training, at 3 months out, resulted in quicker reduction in pain and improvement in function, when compared to stretching alone. However, 3 months was the magic time period. Before three months and at 6 and 12 months, strength training was not superior to stretching. So, how does this research study on plantar fasciitis converge with the Jules Mitchell Portland Tour? Jules is one of the teachers in my dissonance piece. She is a biomechanist and yogi, who wrote her masters thesis on the science of stretching and turned the world of yoga on its head. One of her workshops that I attended this weekend was an impressive attempt to distill 3 years of research on the biomechanics and neuromechanisms of stretching into 8 hours of yoga workshop. The piece that is relevant here, further distilled from 3 years of research to 8 hours of workshop to two minutes of interpretive writing, is that loading connective tissues, which happens in active static stretching and isometric and eccentric training, is how we get stronger, healthier connective tissues. It is all about the load. You must input load. It is so much more complicated and nuanced than that…I challenge you to learn more by reading Jules’ seminal post on tissue mechanics, which begins her blogging journey of her thesis work. In explaining results of the plantar fascia study, the authors confirm Jules’ findings that large tensile forces (loads) are associated with improvements in symptoms in conditions involving degenerative changes, like plantar fasciosis. Since the plantar fascia is composed of type 1 collagen fibers, it responds to high loads by laying down more collagen, which may help improve the condition. An additional benefit of high-load strength training is increased ankle dorsiflexion strength, as decreased ankle dorsiflexion strength has previously been identified in those with plantar fasciosis. With a little creativity, you can use yoga props to combine ankle dorsiflexion and controlled loading of the plantar fascia. This exercise can be used by those with or without plantar fasciosis, as it trains active mobility and improves strength at end ranges of motion in your feet and ankles, which is good for everyone. We know that strong, flexible feet are healthy, happy, and mobile. I use a block, half round, and yoga mat. 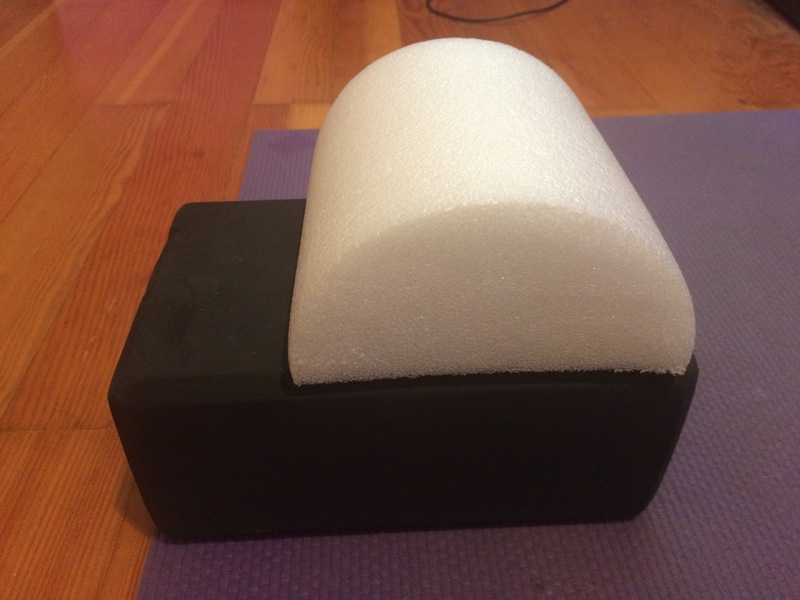 You can use a stair step or low stool in place of a yoga block and a rolled up towel or yoga mat for the half round/mat combo in the images below. 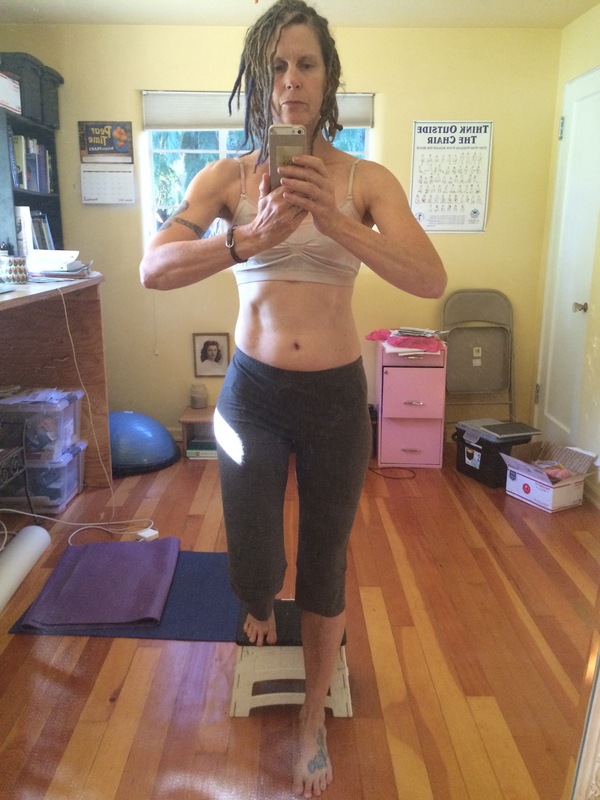 The first two pictures show my naked set-up, but I actually cover the whole contraption with a yoga mat because the half-round slides on the block without the mat, when I start doing the exercise. You probably won’t get slippage if you are using a towel instead of a half-round. Place the toes of your right foot on the mat-wrapped half-round (towel), so that they are maximally dorsal flexed, meaning your toes extend back towards you. Place the ball of your foot on the block (stool or step). Hold onto a chair/rail for balance and slowly, over a period of 3 seconds, lift your right heel, so that you rise up onto the ball of your foot (concentric phase). Remain in the raised position for 2 seconds (isometric phase). Slowly lower your heel, over a period of 3 seconds, to slightly below the level of the block (eccentric phase). The rise, hold, & lower is one rep.
Repeat up to 12 times (reps) for up to 3 sets. Once you can do 3 sets of 12 reps, play around with increasing the load by wearing a loaded backpack. You might decrease the number of reps at this new load, but increase the number of sets. The idea here is to progressively load the tissues as you get stronger. Perform this exercise every other day. If you find you are not strong enough to do unilateral heel raises, try using both feet at the same time until you are stronger. This protocol is just a suggestion. Modify the load, reps, sets, and props, customizing it to suit your strength, flexibility, and movement history. P.S. Look at how in the first picture, both ankles are dorsal flexed; and in the second both are plantar flexed. Not intentional. Just a neural pathway, I guess. 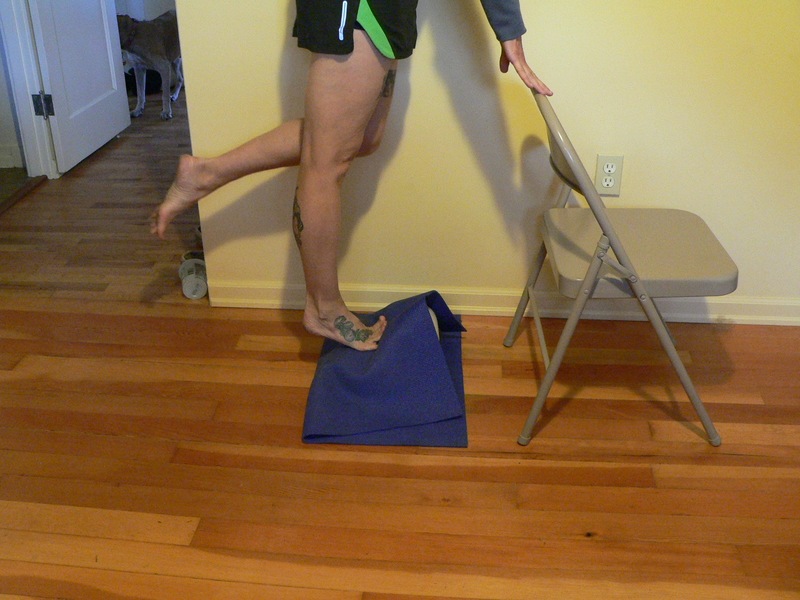 Consider adding this exercise to your foot health protocol of stretching, strengthening, and mobilizing your feet.